A reconnaissance multicopter, part of UIMC's new UAV complex. 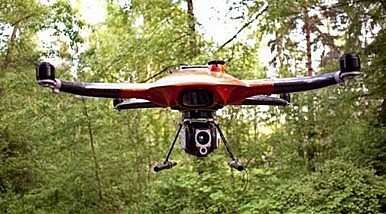 A prototype of a new missile-firing multicopter drone was presented at a robot conference near Moscow. Last week, Russia’s Ministry of Defense released a 44-second video of the prototype of a new multi-copter unmanned aerial vehicle (UAV) fitted with cameras and a shoulder-launched rocket system. The new missile-firing multi-copter drone was showcased at a Russian Armed Forces robotics conference, held near Kubinka in the Moscow Region. During the demonstration, the UAV is seen engaging multiple simulated armored targets with its missiles. However, the multi-copter appears to be a single shot solution, with the aircraft having to land and reload after each shot. “The rocket appears to be unguided and visually sighted, as evidenced by the ‘rocket-eye view’ of the on-board camera in the opening seconds of the footage and the optical sighting system that has been flipped down over the lens,” IHS Jane’s International Defense Review explains. The new UAV has been developed by the United Instrument Manufacturing Corporation (UIMC), a subsidiary of Russian Technologies State Corporation (Rostec). According to Russian defense industry officials, the multi-copter is also armed with a built in flamethrower. The drone showcased at the military robot conference is purportedly part of a multi-copter complex, consisting of several drones including a robotic helicopter, reconnaissance multi-copter, sentinel multi-copter, and the anti-tank assault multi-copter. The drones are all are equipped with the GLONASS/GPS navigation system. The robotic helicopter, according to information supplied by Rostec, has a range of several hundred kilometers and can perform video surveillance, whereas the reconnaissance multi-copter is fitted with a thermal imaging device to identify possible targets, and the sentinel multi-copter can verify targets and direct artillery strikes. The drone complex “is called to replace [soldiers] effectively where it is possible, be it scouting, patrolling, monitoring, cartography, transportation and combat missions,” Sergey Skokov, Rostec’s deputy director general, told Russian media. The multi-copter complex is controlled by a mobile control center, which can operate autonomously up to a week and “takes less than 15 minutes” to set up, according to RT. An aircraft model at the MAKS airshow near Moscow might provide some clues on future Russian UAV programs.